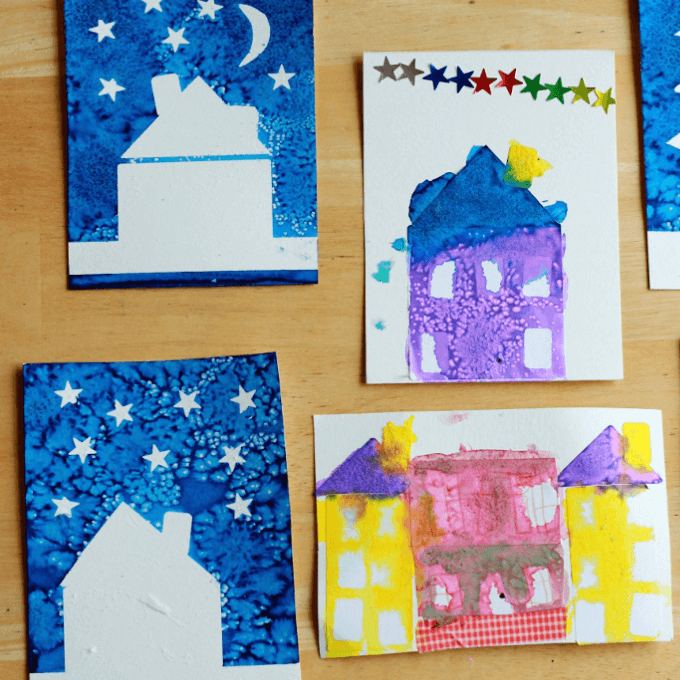 Since doing the glue resist winter art project last week, we’ve been trying a couple of other winter art ideas, including another version of the sticker resist starry night sky. With this one, we used the star stickers as before, but also used some other stationery store stickers to create houses, sky scrapers, and cars. All with the starry night sky background. 1. Use the stationery store stickers to create a house (or skyscraper, cityscape, car, robot, trees, boat, rocket ship, etc). You can assemble a variety of labels and other stickers as desired and even cut some of them into the shape you would like. (We cut out a couple of crescent moons. And some triangles for house roofs.) Add star stickers for a night sky effect. Tip :: To make the stickers easier to remove later, press each against your pants first before pressing it to your paper. For an optional step, you can draw details on your sticker collage artwork as Daphne did. 2. Paint over and around your sticker house with watercolor paint for the night sky. Sprinkle salt on the wet watercolors if desired for a starry look. If, like Daphne, you (or your child) would prefer to paint the sticker houses rather than the surrounding paper/sky, that’s okay too! 3. Let dry. Brush off the excess salt then lift off the stickers and washi tape, revealing the sticker scene. If desired, you can trace the buildings and add detail at this point with a pen or pencil. How about you? Do you have some stationery store stickers you could use for a sticker resist art project for kids? These are some great ideas! I am just getting into washi tape. (I know, a little late to the party!) I can’t wait for your new book!!! I missed getting two of the ebooks which are now no longer available, at least for now, so I’m anxiously awaiting the book! Thanks, Betsy! Hope you enjoy washi tape! It’s one of our favorites!